Richard Thompson gave a memorable performance of his folk oratorio Cabaret of Souls in a UCLA Live concert at Royce Hall on Friday night. Perhaps it was the tall stone walls and arches of the building, and perhaps it was the layers of costuming on everyone working at the venue, but as the audience simply walked into Royce Hall they just knew something different was awaiting them. The usher who checked my ticket was wearing a long cape and a wolf mask, and all the other ushers, too, had their own unique set of late 1800’s English togs and a different mask. Think of the masquerade party in the movie Eyes Wide Shut and you’ll get the vibe. Cabaret of Souls began as a project that Thompson was commissioned to write by the International Society of Bassists for bass player Danny Thompson (no relation). It evolved from a suggested 6 minute passage into an hour and a half-long presentation of songs and narration. One hugely impressive aspect of the production was that on every level the concert hall was turned into the In Between — not heaven or hell, but a rather boring place with no chance of escape. With so much time on their hands the waiting souls in the In Between sang about their mortal lives and we listened. Everyone who was part of the show, onstage or off, in the lobby or in the theater, was in costume and it surrounded the audience to marvelous effect. The evening began as the Idyllwild Arts Academy Orchestra took the stage, some with gigantic teased hair, all dressed in vivid black and red, no two alike, with painted and sequined faces. It was an elegantly astounding image and they were conducted with panache by Peter Askim. Then came the band in period costumes, led by Thompson in a long double-breasted overcoat and top hat. They proceeded to play 23 songs that portrayed the lives of characters ranging from, but not limited to, a glutton, a love-lorn broken heart, a gangster’s moll, an art critic, a religious hypocrite, and a war financier. Projected images on a backdrop advanced the stories in the songs and effectively reinforced the fact that we were in the In Between. There was also one great lighting effect that bathed the upper part of the hall in angular, dappled light to magnify the dankness. Vocalist Judith Owen shone all evening long, and her vocal on “The Linnet” was gorgeous. Pete Zorn sang backups and played flute, adding several interesting layers to the band’s sound. 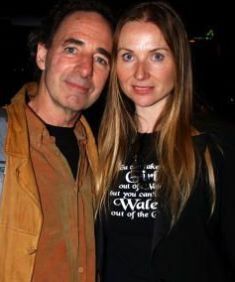 And then there was Harry Shearer, who did not actually play an instrument but who — with his warm and familiar witty sensibilities — made the In Between a very entertaining place to listen to music. He had something witty to say after every soul had sung, never going any farther than drollness with his critiques. Most of all, the playing was impeccable. Thompson has a long-standing reputation as one of the tastiest and expressive guitar players around. His breaks on Friday were beautiful examples of how to say something musically meaningful in a concise but ornate style. His solos featured a remarkable mix of multi-string arpeggios and clever linear phrases, never getting too busy and always giving the music some room to breathe. Each member of the band was given several showcases, pumping up the dynamics and pace of the show. Percussionist Debra Dobkin played a very crisp trap kit with a light feel, and added embellishments as well as singing harmonies. Bassist David Piltch played a standup bass for the whole show with a sound that was superb, filled with the lows were pronounced but never excessive. When Piltch soloed, the tone was tremendously clear and warm for peak effect, serving as a showcase for just how good an acoustic bass can sound. Many people who went to see Richard Thompson perform Cabaret of Souls likely had little idea of what they would actually see. Bu it’s hard to imagine anyone attending this show walking out with anything other than a feeling of being pleasantly surprised and hugely entertained. 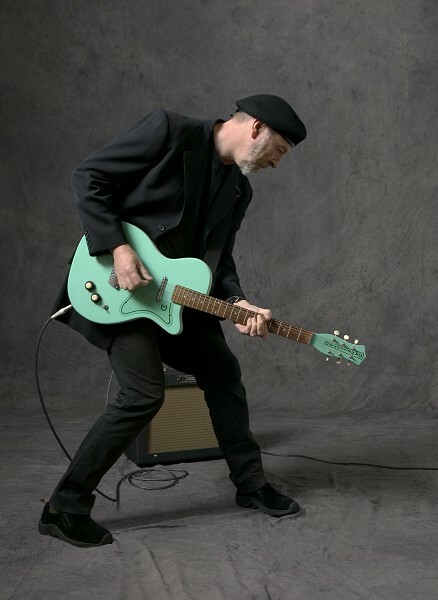 Richard Thompson photo courtesy of UCLA LIVE. To read more reviews by Mike Finkelstein click HERE.